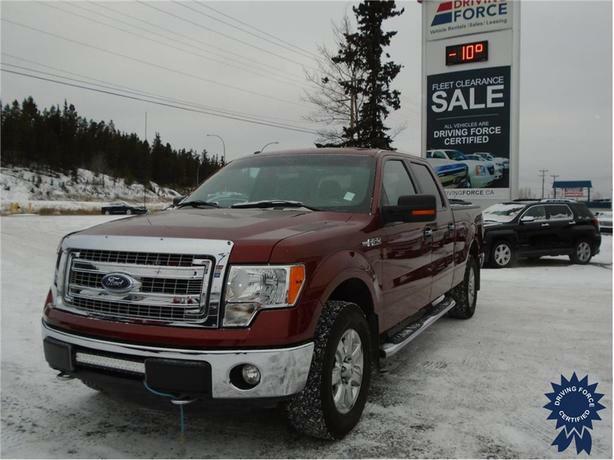 This 2014 F-150 XLT Supercrew 6 Passenger 4X4 6.5-Foot Medium Box Truck comes with a 157-inch wheelbase, electronic 6-speed automatic transmission, electronic transfer case, limited slip with 3.73 axle ratio, 17-inch wheels, sunset metallic exterior color, premium cloth 40/20/40 split bench seat, trailer tow package, 155-amp alternator, black power glass heated side mirrors, power driver adjustable seat, platform running boards, auto locking hubs, front fog lamps, manual tilt steering column, three 12V DC power outlets, 1,570 lbs Maximum Payload, and GWVR rating of 8,200 lbs (3,720 kgs). The 5.0-litre V8 gas engine provides 360 horsepower at 5,500 RPM and 380 lb-ft of torque at 4,250 RPM. Touch base with us to discuss purchasing or financing options that are right for you and experience the difference you will only find at DRIVING FORCE Vehicle Rentals, Sales and Leasing.